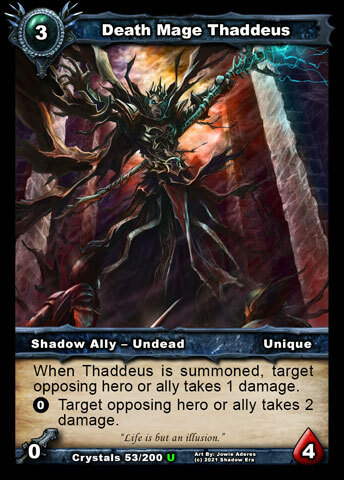 Death Mage Thaddeus is, in my opinion, one of the most versatile 3 cost allies in any TCG. His on-summon ability alone would make him worth playing, but his ability to nullify targets through stealth is what I think carries him to high-level play. I'm so enamored with him, in fact, that my first Shadow Era fanfiction was written from his perspective! Ability: When Death Mage Thaddeus is summoned, target opposing hero or ally takes 1 damage. 0: Target opposing hero or ally takes 2 damage. 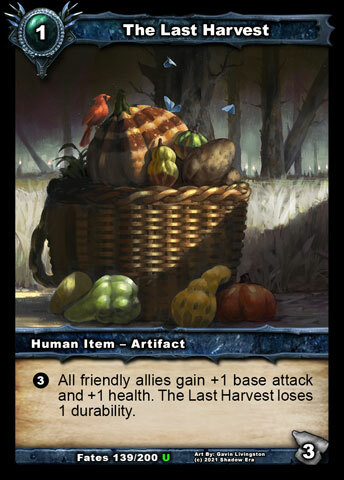 In ages long past, Scheuth was a vibrant and beautiful world that rivaled any yet seen. Like those worlds, it had no form of magic beyond that written in story books or in the imaginations of children. Had it not been for the one researcher's studies to qualify 'life' and 'death' it might have remained so. Instead, it was discovered that when a being died a small amount of energy was released. Energy that could be harnessed to achieve incredible things. Over time this research caused the leader of a small nation to look further, searching for ways to exploit these energies. Eventually his lead researcher, Thaddeus , found a way to utilize these energies to grant someone a form of unending life. At first his theories were laughed at, until he put them to use to turn himself into something entirely new. Then his discovery became lauded and was quickly implemented by his employer to transform the whole of their army into undead warriors. The wholesale slaughter of any that opposed the new order was swift, leaving Scheuth a barren wasteland across the planet's surface. Despite their new gifts some of the undead turned on the new Emperor, forming a rebellion determined to claim all he possessed for their own. Once the Shadow Gates appeared these traitors were better equipped, thanks to the aid of the Man of Shadows and his promise of greater powers. Though Scheuth was the first to claim magic, many among the Shadow feel they paid too high a price for it. Still, the undead walk as single army once again, bringing their twisted concepts to the cause of ending all resistance in Balor.